I’m Nobody’s Muse, no-one to inspire but myself.. I have been asked many times if I write the music or the lyrics to my songs first. They truly usually come at the same time. A melody will often be in my head but until I get some words to go along with it I usually don’t pursue it. I was always this way and my earliest songs were just one long musical that I would make up as I played with dolls and never remembered or wrote down! I like to think some of them were masterpieces lost to the sands of time, but they were probably just crap about fairies and Wonder Woman! Around half of the songs on ‘Before I Forget’ were written a long time ago before I even picked up a ukulele. A couple of them I revisited as I learnt the uke and found they worked really well on it. The guitar songs were mostly written in my down time after The Camdens broke up. Then a lucky few just seemed to come to me as I learnt the uke and began to take myself seriously as a writer. That’s one of the reasons I chose the name for that record. I felt like I was in a lucky creative mode that might never last! Now that I have a band and plenty of gigs to keep the momentum going I am hoping to write even more songs that I care enough about to share. It’s always scary wondering if you’ll ever have another idea. One of my newest songs (Partly quoted in this blog title) is actually about the motivation I feel to keep doing this. Writing, playing, booking, practicing, networking, etc etc all feel a little overwhelming at times and I have to always just pull myself back from that and focus on the music. Thank you to each and every sweet one of you that make me feel it’s all worth it. PS: New Merch page in the works. Buttons, T-Shirts and even jewelry (Hand made by me) coming soon. Uptown, Downtown & Out of Town!! I played a surprise Pop Up show this past Sunday night at a place I’d never been to before. Morrisey’s Irish Pub in Uptown. It was a nice place and it’s always fun to take part in a Hootenanny. I sang the only Irish tune I know which being a musical nerd is from the film ‘Once’. I just love singing ‘Falling Slowly’. It’s so charming on the ukulele and can hush even the noisiest bar. Next up is another last minute show. This time it’s at Peavey Plaza right Downtown (Next to Orchestra Hall, opposite Brits). They just booked me to sing for a couple of hours over the lunch slot. Next Tuesday, August 12th from 11-1pm. The event is free and a nice way to spend a part of your work day. 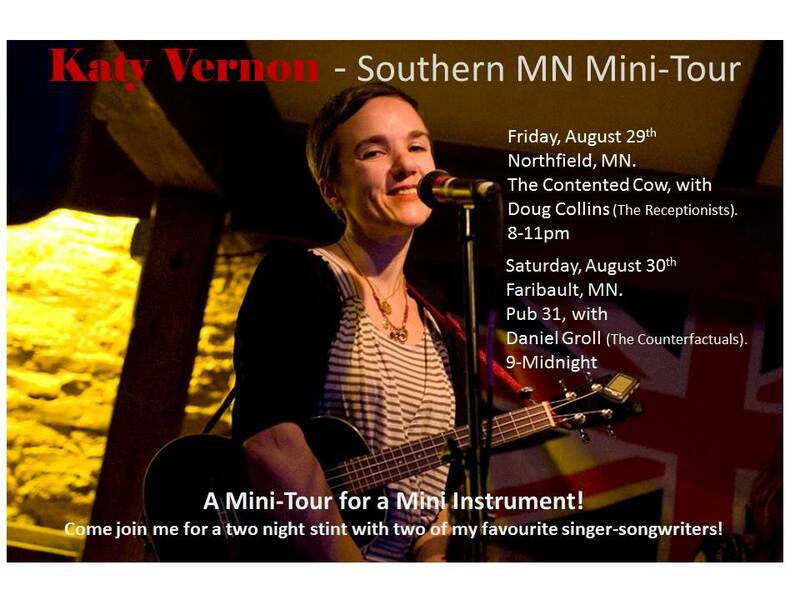 Then coming up at the end of the month I have my first ever Mini Tour. 2 nights in Southern MN. I love love love Northfield and am excited to return there and then I’ll try out a brand new venue in Faribault the next night!! Recording has begun and I will update more on that as progress is made. Most of the next record is already written and I’m enjoying planning out the rest. Hope to see some of you soon and thank you to everyone that helped push my Facebook page likes over a 1,000 this month. That was very exciting! !